Discussion in 'Ancient, Indigenous, & Tribal Calendars' started by Susan Lynne Schwenger, Apr 14, 2014.
through THE MAGiC of FRACTALS"
which is the last full moon in the month of December. utilized by All Indigenous Tribes, Worldwide. which was Calibrated to The Gregorian Calendar aka The Civil Calendar. which lands on December 16th, 2013.
and The Thuban data stream. following the 'End' of the Mayan long count calendar. this Mayan long count calendrical keeping of linear time. and so the Moon astrologically occupies a 'sign' for about 2¨ö (mean solar days). and the Opposition of the Full Moon (allowing Lunar Eclipses). for the 30 degree spread per astrosign aka astro sign. of 25,626.81 or 25,626.83 (Tropical). with the Timeline of The World Logos. Bolon Yokte, the nine-step god with the nine waves of evolution. in the encoding of the scriptures. based on astrological seasons and time keepings. and as described in the Calleman 'World-Tree of the Consciousness'. to the cyclic day/kin count. and, The Forgotten Wisdom as your very own other yourselves. The 'Fall' and The 'Wars between the Worlds'! and NOT The Will of Humanity=Man=Separation! it can go where the light cannot abide, seemingly banished, it is not. so to become illuminated is its destined journey and its troubled lot. the dimensions reduce in space from three to two and all in just the one. the Shadow of the body, does it not merge all in its rule under the sun? as nature's very own offspring, the young ones grow towards their final goal. the reconciliation for the suffering body with its spirit and its scattered soul." Tony Bermanseder & Susan Lynne Schwenger on 25-26 JULY 2012.
run by Bill Ryan and Kerrie Cassidy. to the current Gregorian Civil Calendar. that was first adopted in 1582.
the wavelength of Orange Light. or the Planckian Quantum Action Constant 'h'. based on the numeracies as given in the above. AND START THE NEW BEGINNING WITH THE OLD END!" and so on with 26=17*=8** and 27=18*=9**. and as described in the Dresden Codex of the Mayan historian database. we find ABCD=H with D=465612; C=256124; B=361242 and A=312423. one of the largest in the Maya world. and it stands over 45 metres (148 ft) high. limestone dome rising above the surrounding lowlands. This dome was artificially leveled by the Maya. The stone used in construction at the site is a soft limestone. This has resulted in severe erosion of the site's sculpture. and a massive amount of land and buildings. and ruled the land up to 150 kilometers away. in what is now northern Guatemala. while Calakmul emphasized joint male/female rule. There are even some carved stone stelae at Calakmul depicting queens. Tikal finally dominated, but not before Calakmul put its stamp on the Mayan world. at Calakmul with five stelae in front of it. which equals 9,360,000 Days / Kin, the exact length of The Grand Cycle. and 5 Markers x 13 cycles of 144,000 days = 9,360,000 Days - Kin"
is definitely part of the adventure. in Mexico until you finally reach the archaeological site itself. we saw two deer, a toucan and a grey fox. The preserve is also home to pumas and more than 250 species of bird. That jungle feeling continues even after you’ve entered this archaeological site. and 6,500 structures believed to still be hidden in the ever-encroaching jungle. of an older Preclassic period temple. This group of buildings may have been used to determine the solstice. The number of stelae in front of it is remarkable. is the city’s collection of stelae. and political facts about the city and the kingdom. of The Central Plaza at Calakmul with five stelae in front of it. as seen from the top of Structure VII. that pretty much ensures you won’t miss anything. –that can (and should) be climbed. size and placement of the other temples. which poke through the dense jungle. Classic Calakmul: stairs and stelae. Structure II is one of the largest buildings in the Mayan world. and views across the city. of El Mirador archeology site in Northern Guatemala. (the really REALLY big temple). because it was built on a slight hill. The stelae in front of it date back to 731 AD. Karen surveying the Mayan world at Calakmul from the top of Structure I.
Don’t feel like doing the Mayan stairmaster? of the amazing Calakmul archaeological site. Part one shows the enormous Structure II as seen from Structure VII. Part two is a panorama shot over the site shot from the top of Structure II. including a look across to the even-taller Structure II. which is quite a ways away and something of a hole. (most importantly) very good screens. in the backyard and a small family of howler monkeys in the front yard. was inspired by the swarms in and around the Calakmul Biosphere Reserve. to be able to relax on the little porch in front of our bungalow. It didn’t work, but the hundreds of zaps were satisfying nonetheless. deep in the jungles of the greater Petén Basin region. It is 35 kilometres (22 mi) from the Guatemalan border. ever uncovered in the Maya lowlands. was known as Ox Te' Tuun. of their emblem glyph of the snake head sign, to be read "Kaan". This Snake Kingdom reigned during most of the Classic period. and had governance, at times, over places as far away as 150 kilometers. of which is the great pyramid at the site. Four tombs have been located within the pyramid. is about 20 square kilometres (7.7 sq mi). have been likened to a struggle between two Maya superpowers. at Chichen Itza in March 1932.
so 'Calakmul' is the 'City of the Two Adjacent Pyramids'." of the ruins of El Mirador. to both El Mirador and Calakmul itself by causeway. Calakmul was about 20 kilometres (12 mi) south of the contemporary city of Oxpemul and approximately 25 kilometres (16 mi) southwest of La Muñeca. to denote a low-lying area of seasonal marshland). and was an important source of water during the rain season. around the site core, an area considered as Inner Calakmul. and access to abundant flint nodules. rising above the surrounding lowlands. This dome was artificially levelled by the Maya. remained covered by dense forest. than further south in Guatemala. and to have covered an area of over 70 square kilometres (27 sq mi). of about 13,000 square kilometres (5,000 sq mi). and the rural population plummeted to 10% of its former level. in the periphery (an area of 122 square kilometres (47 sq mi). which may have been because of the triadic pyramid Structure 2. Naachtun, Sasilha, Oxpemul and Uxul. has been estimated at 200,000.
that include temples, palaces and stelae. The total rural population of the kingdom is calculated at 1.5 million people. is calculated at 1.75 million people in the Late Classic period. the Emblem Glyph of any other Maya city. than any other Emblem Glyph, including that of Tikal. Calakmul was the seat of what has been dubbed the Snake Kingdom. At times the city had governance over places as far away as 150 kilometers. ("Divine Lords of the Snake Kingdom"). This list is not continuous, as the archaeological record is incomplete. All dates AD. Stela 51, dated to AD 731, depicts Yuknoom Took' K'awiil. right through to the Postclassic. when Calakmul itself was the most powerful city in the region. and Nakbe in the Middle Preclassic. it with its own network of allies. in a decisive battle that took place in AD 695.
over Calakmul's most important allies. Eventually both cities succumbed to the spreading Classic Maya collapse. on more than competition for resources. between the two powers may have had an ideological grounding. of the distant central Mexican metropolis of Teotihuacan. to the female line and often the joint rule of king and queen. Calakmul was already a large city in the Preclassic period. has been pieced together that extends back into an ancestral past. of El Mirador and Nakbe. l in the Classic period after the collapse of these cities. 2. Sharer & Traxler 2006, p.356. Folan et al 1995a, p.310. 3. a b c d e f g h i j Folan et al 1995a, p.313. 4. Folan et al 1995a, p.311. 5. a b c d e f g h i j k l m Sharer and Traxler 2006, p.356. 6. a b c d Folan et al 1995a, p.310. 7. a b Braswell et al 2005, p.167. 8. a b c d e f g h Braswell et al 2005, p.165. 9. a b Braswell et al 2005, p.171. 10. Braswell et al 2005, pp.164, 188. 11. a b c d e f Braswell et al 2005, p.170. 12. a b Braswell et al 2005, p.162. 13. Schele and Freidel 1990, pp.456–457 n.21. 15. Martin & Grube 2000, pp.101, 104. 16. Martin & Grube 2000 p.113. 17. Martin & Grube 2000 pp.102-115. Sharer & Traxler 2006, pp.360-361. 18. Martin & Grube 2000, p.101. Braswell et al 2005, p.162. 20. Sharer & Traxler 2006, p.495. 21. a b Sharer & Traxler 2006, pp.495-496. 22. a b Sharer & Traxler 2006, p.496. 23. a b Sharer & Traxler 2006, p.497. 24. a b c d e f g Martin & Grube 2000, p.103. 25. a b Martin & Grube 2000, p.102. Sharer & Traxler 2006, p.357. = 9,360,000 Days / Kin. as its provider of tonalli (Shadow Soul) life energy. Cipactli is an auspicious day, signifying advancement and honor. It depicts energy and work, rewards and recognition. A good day for beginnings. 1-Cipactli is the first day of new tonalpohualli, or 260-day religious calendar. It is an excellent day for beginnings or celebrations like a singing feast (cuicuicaliztli). is ruled by Tonacatecuhtli, Lord of Nurturance, munity; bad days for solitude. became tied to the Julian calendar as used by the Spaniards. (this site provides the pre-conquest calendar). 13- Xochitl - Flower is last day of a tonalpohualli of 260 days. Tochtli is the last trecena of the sacred year. It signifies the end of one cycle and the beginning of a new one. and, the beginning of the next grand cycle. NOT out by 360 days, all days can be accounted for"
which is the length of the ancient year." on the last full moon of December. which proved these dates were correct. neither in 3D nor in string-membrane space of 12 dimensions." " PUTTING YOUR HEART INTO WHAT MATTERS "
"GETTING TO THE HEART OF WHAT MATTERS "
or 26,001 ancient years, respectively. the actual beginning of 17 December 2013.
in the month of December. as, it is the deeper agenda of The Tzolkin and The Haab Calendars. and the solar year of the seasons as indicated previously. The 'Loom of The Maya'. and, simply created something they termed "one day out of time"
which they added to the month of July, each year. but, more philosophical in its nature. with the Tuns and Katuns and Baktuns of the GMC in a 'common factor'. (with an error of about 563.5 days for this definition of a year). which factor both the Tzolkin and the Haab in 1366560=260x5256=365x3744. utilising an assortment of indigenous calendars. and 195 years ago from 2014.
as their own Descendants and 'Extra-Terrestrial' Cosmic Family. and The Tzolkin of 260 Kin. and characterises a typical 'life span' or Mayan generation. in the MF+260 = 1460+260 = 1720 Kin as 4 Haab + 1 Tzolkin. in the 360 Kin count and being the same as 1.872 Million Haab in the 365 Kin count. to the first Galactic Moon in the New Mayan Time is presented following. the deeper purpose of the Tzolkin and the Haab. regarding the time keeping of the indigenous cultures and civilizations. then we shall elaborate on the indicators given in this address. for the plantings and the harvests. also known as The Dreamspell calendar. to an annual recurrence of July 26th. can be used in such a calibration or assignment. as 360 degrees in a circle for a Tun being 18 Uinals. and, Susan Lynne Schwenger and Tony Bermanseder in 2010. = 720,000 Kin to 0.0.0.0.0 for 13.0.0.0.0 for December 21st, 2012 Gregorian. of the order of 10s and 100 thousands of years. in say a scientific definition for the length of a day and the duration of a second. for such a definition for the keeping of time. as 1300 Katuns being 5x13=65 Baktuns. =26,000/365.2425=71.186 'civil years' per degree. in so 1/0.000301 or 3320 civil years. and the Center of the Milky Way or Perseus galaxy. by the cosmic elders of the realms. but for the entire universe defined in the parameters of space and time. in the fossils and records of anthropology. into its Homo Sapiens and Homo Sapiens Sapiens form. its 9,360,000 Kin or days. The Great Year, or even The Great Cycle. aka The Great Year aka The Sacred Year is 360 Ancient Days. that any of the calculations below can be utilized in calibrating 'real' time. and, the relation of 6480 degrees in The Dodecahedron. The Tun Cycle(360 Days) that RULES the universe. utilized the 360 Day Calendar. the day before the last full moon in December of 2013.
because, this date is the last full moon in December of 2013.
to be totally accurate, and, factual. back when she was 25 years old. but, on every other continent in this world. through black and blue moon cycles. (there are just too many tribes to mention all of them). and, The 360 Day Ancient Calendars of The Aboriginal of Australia. The 27th, 28th, 29th, 30th, and 31st Days of December. aka supernumber showing we live, in a 12 level universe"
proof we live in a 12 level universe. 5 cycles x 13 cycles of 144,000 day = 9,360,000 ancient days. to mark the NEXT Grand Cycle. by Susan Lynne Schwenger between 1975 to 1987.
which proved all tribal calendars are in alignment. anyone else, who may of guessed this date, did NOT have the proper calculations to prove their work. The Grand Cycle of Pacha iNTi"
WHAT PEOPLE ARE SAYING ABOUT US !!! Copyright © 2000-2025, 2000-1975 . All Rights Reserved. when she was 25 years old. that represent The 28 Days between New Moons. So, The Turtle is a 13 Moon & 28 Day Calendar." which appear on the back of The Turtle. on the back of The Turtle. which make up the lunar year. which represent the twenty-eight days between the new moons. along with special stories to go with each of them. in which each of these new moons will appear. which equals: 2+2+2+2+2+2+1=13 aspects There are also, 13 poles in a standard tipi or teepee. This is, the number of days between The New Moons. of The Sacred Star of David. aka Spiritual Medicine Man or Spiritual Medicine Woman. or sky travelers' or 'star blowers' or 'star gazers' or 'spiritual medicine man or spiritual medicine woman', who are known for their abilities of: dreaming, healing, intellect, meditation, philosophy and wisdom. The Turtle is known as, The leader of The Fish Eaters Clan. migrating, territorial, bottom feeders, top eaters, late spanners and early spanners. In the beginning, The Great Spirit aka Gizhemanidoo created The Universe. along with The Mother Earth and The Father Sky. And on The Earth he created all things, living and nonliving. He created the life in The Earth, and, on The Earth, in The Sky and in The Water. He created the flowers, plants, and trees. He created The rivers, streams, oceans & seas. He created The four-legged, and, The two-legged. He created The Serpents, and, The no-legged. He created The Winged Creatures, and The Swimmers. to bring harmony and balance to all. After all creation was complete, he created man. that he gave him, Anishinaabemowin. – all the animals, insects, birds and fish, however long this took. and now it is time for me to give you your name. and greet one another, they will say a part of your name. they say the word Bozhoo. was put on the turtle's back after the great flood. 360 days + 1 day (added to FEB) + 5 days = 366, in a leap year. which is almost all of them. a baby spends in its mothers womb. In 360 Days, there are 360 days in an ancient year, and 360/360 = 1 ancient year The full moon of 17 December 2013, at sunrise marks The Start of The Grand Cycle of Pacha iNTi. The evening of the day before the full moon, at sunset marks The End of The Grand Cycle of Macha(9,360,000 days) + Pacha (360 days). therefore, it can NOT be the end of a grand cycle. The 22nd of December 2012, was NOT the day of the full moon, Therefore, it can NOT be the start date of a grand cycle. - which is exactly The Length of An ancient year, 360 Days. she did NOT know the cosmology, nor have the mathematics to prove it. that was required to solve the puzzle. ~and, discovered the correct set of dates. Is there a literal meaning for the name Nanabozho? Why did he wait for Creator Gizhehemanidoo to tell him who he was? I would think it would be better for Nanabozho to discover the name for himself. -- including the story of the world's creation. both The Trickster and The Culture Hero !!! into a single figure in First Nations mythologies. and is characterized as a trickster. ("Great rabbit" or "Hare") or Chi-waabooz("Big rabbit"). He was sent to Earth by Gitchi Manitou to teach the Ojibwa - Ojibwe - Ojibway. One of his first tasks was to name all the plants and animals. Nanabozho is considered to be the founder of Midewiwin. He is thought to be the inventor of fishing and hieroglyphs. This deity is a shape-shifter and a co-creator of the world. Nanabozho saves the forests from Paul Bunyan. killed Bunyan with a Red Lake Walleye. Yes, there are many stories involving Nanabozho. it's another way of saying creating things. The Dreamspell is a description of the synchronic order. The Long Count is the sacred count of days. Both use the same harmonic standard - the Tzolkin or Harmonic Module. For Dreamspell, the Harmonic Module is an absolute fourth-dimensional referencing matrix and synchronic gauge. For the Long Count, it is an ever-recurring 260-day count beginning at 4 Ahau, 8 Cumhu August 13 BC 3113 (3114), and which establishes endless cycles of vinals, tuns, katuns, and baktuns. The Dreamspell is a new dispensation. Its count is calibrated to 8 Wizard, July 26, 1987. It utilizes the reformed 13 moon 28 + 1 day Tun Uk and Haab 365-day counts as its measure. Since its purpose is twofold - to displace the artificial and irregular Gregorian calendar, and to establish the synchronic order and the Law of Time as a new basis of knowledge and the reformulation of the human mind as a purely fourth dimensional knowing, it operates in perfect 52-year solar-galactic cycles. It does not recognize leap day and so maintains the perfection of the synchronic order - a purely fourth- dimensional order in which the irregularity of leap day does not occur. As long as the Gregorian calendar is still in use as a point of reference, leap day, February 29, is counted as 0.0 Hunab Ku. When the human is harmonized in the supermental order of the Law of Time, and the Gregorian calendar is no longer known or recognized, we will be able to telepathically stabilize the Earth’s rotation at a perfect 365 days and the leap day will be eliminated. There is no conflict between Dreamspell and the Long Count. They are merely two different standards that serve two different purposes, both operating with different applications of the same system. The synchronic order harmonizes all timing systems, including the Long Count, all lunar calendars, etc. Currently, between February 29, 2004 and February 28, 2008, the difference between the Dreamspell and the Long Count is 49 days. Between 2008 and 2012, the difference will be 48 days, and after February 29, 2012, it will be 47 days. Hence today, Kin 196 Dreamspell, is Kin 147 Long Count. (Northern) Winter solstice 2012 will be Kin 207 Dreamspell and Kin 160 Long Count. People who believe that there is a conflict between the two systems are still immersed in dualism and are fixated on being right. The future spiritual-mental evolution depends on holding multiple views simultaneously, of seeing the inherent harmony in all forms of order whatsoever, and of experiencing non-dual unification of self and other. is NOT the right calibration between Civil Calendar Gregorian - Julian Calendar - and, Tzolk'in - and, Long Count dates !!! On the Gregorian calendar, January 24th happens to be my birthday. That is why I took special note of a news story brought to my attention the other day. The headline read: Monday, Jan. 24, called worst day of the year." The subheadline states, "British psychologist calculates most depressing day." It was the calculations of Dr. Cliff Arnall, a psychologist at the University of Cardiff, Wales, who specializes in "seasonal disorders," that most aroused my curiosity. The equation is broken down into six identifiable factors; (W) weather, (D) debt, (d) monthly salary, (T) time since Christmas, (Q) time since failed quit attempt, (M) low motivational levels and (NA) the need to take action. This highly amusing piece of academic psychology perfectly demonstrates how a calendar is the macroprogramming device of the culture or society that uses it. This research has no meaning if you are not following the Gregorian calendar and, consequently, living in a consumer based society programmed by that calendar to have its peak spending experience in the last month of its calendar year. This peak consumer blowout is followed by the calendar's "new year's" program in which the excesses of the holiday season are redeemed by some kind of resolution - which, according to Dr. Arnall's research, holds no longer than the first seven days of the new year. The formula devised by Dr. Arnall pivots on the underlying philosophy of the Gregorian calendar, "time is money." After all, the word "calendar" itself is derived from a Latin word meaning "account book." This piece of research we call "thinking inside of the box." It is riddled with unexamined assumptions, due to a lack of awareness that the investigations are totally limited by the unexamined box within which they are operating. The box, in this case, is the Gregorian calendar as an annually repeating mental program. Take away the Gregorian programming device and what do you have? The emperor without any clothes. Of course, Dr. Arnall was conducting his research in the UK, so his findings are valid for the UK, or possibly most of the Western consumer world governed by the Gregorian calendar. But just to show how relative these findings are and how arbitrary are the behavioral conditionings of the Gregorian calendar, consider what happens if you live in a society that does not follow this calendar. What if that day was, instead, 13 Dhul -hajj? Hmm. You've just completed the annual Hajj pilgrimage to Mecca. Not much depression there, unless you are thinking about those Americans in Iraq. Or how about Hong Kong or Shanghai - it's 15 Ding Jou, and you're thinking, "The real New Year is still two weeks away!" Yet Dr. Arnall presents his findings as if there were no other way things could be. According to Dr. Arnall's findings, the Gregorian calendar programs you for debt, depression and spiritual failure. And you are powerless about it. Why follow a calendar that programs you for depression, that saddles you with worries about when you have to pay your bills, and whether your salary will compensate your debt? Or even worse, why go along with a calendar with a built-in loser streak syndrome so that, like an alcoholic who can't get a grip, you are set up to break your new year's resolutions - by Dr. Arnall's calculations - one week later? Yes, programmed for spiritual failure! Add to that, that next year, January 24th won't fall on a Monday. Monday being the beginning of the work week is always more depressing, for instance, than Friday. So will the most depressing day be January 23, which will fall on a Monday? Which gets to another point: The irrational irregularity and lack of coherent order to the Gregorian calendar. Not only does it program you for depression, debt fear, and spiritual failure, it also programs you to get numbed-out when you think about time. The days of the week and the days of the month never correlate. It is hard to figure anything out that way. It affects your mind when the most you can say about the calendar is "30 days hath September, etc." Is this the way it will always hopelessly be in the dominant civilization of planet Earth, or is there a better way? We need a new Calendar! Of course a new calendar would also mean a new society and a new way of doing things. For precisely that reason, the world has not gotten a new calendar - despite the appeals of common sense and many noble efforts over the past century and a half. The problem has been that we always need to wait for the Vatican, the President or Congress, or the UN to approve the new calendar. As society has gotten more complex, the odds of it happening this way have decreased. But that has only made the programming of the old calendar that much worse. We can't wait any longer. The old time is literally killing us. Waiting for the decision topdown - forget it. The thing to do now is to change the calendar yourself. That's right. The way to beat the hopeless depression built-in to the old calendar is to begin to live by a standard that is harmonic and which might make you hopelessly happy, because it is harmonic. I speak from experience. I no longer follow the old calendar. I live by a different calendar in which there is no January 24th, but instead, the date is Resonant Moon, Dali 15. In fact, there is no more September, November, June or July, much less Monday, Tuesday, Wednesday, etc. All the millennia of worry and superstition loaded into those names is gone for me. So I don't have anything to get depressed about. But I do have something new to learn and new values to program into my habits and character. Values like peace and harmony and cooperation and joy. Maybe I was prescient and knew that if I changed the calendar my birthday wouldn't have to be the worst day of the year anymore! It is a sweet irony that, as a figurehead in a world-wide movement to change the calendar, my birthday would happen to fall on the "most depressing day" of the old calendar year! Since 1989, I have promoted a new calendar, a perfect harmonic standard of thirteen months of 28 days each. The idea has caught on. Today more and more people from over 90 countries worldwide are doing the same thing. They are not waiting for the Vatican or the UN to say it is OK. They are following a new calendar that they know will help make them happier, more peaceful human beings, and, if adopted by all humans, would bring peace to the human race. The numbers of people adopting the new calendar increase as we see typical news stories trapped in the hopelessness of the old time: "Terrorism in 2020 will be even more sophisticated and impossible to track." Or "By 2033 one third of the world's population will live in slums." or "By 2015 there will be a major water shortage." Or "By 2010 the Gulf Stream won't be flowing." You see, a calendar that is a hopeless irregularity cannot be programmed for peace or harmony - only for irregularity. And with a calendar in which depression and irregularity are routinely programmed you will only add to the helplessness felt in the face of an increasingly complex world where depression, we are told by WHO (World Health Organization), only increases as more and more jobs are spent shackled to a computer. The fact is, there is no way we can keep the information revolution from crushing us from an avalanche of unregulated information - enough new gigabytes of information in 2002, if translated into books, that would have required 37,000 new Libraries of Congress! Mentally you can't even cope with that. The old calendar only enhances the hopelessness. These are just a few more reasons why we need a new calendar. We've already built the tower of Babel. We can't hear ourselves think anymore and there is too much to choose from to even begin to be able to discriminate. We have to start over again on a new, more streamlined, more harmonious program. We need to call a "Time out from war!" in order to change to a new time. And in that "time out" we can say, "Let's put down our guns for a little while and see what it's like to live without them so we can shift gears. We've run out of time for anything else!" Have you ever seen an ice tsunami? Ontario, Canada, on May 11, 2013. It destroyed more than 20 houses in just 15 minutes. The ice looked like fingers creeping up to residences. Truly bizarre--a slow-motion ICE TSUNAMI in Thunder Bay, Ontario. It supposedly destroyed 20 homes in a matter of minutes. of Macha (9,360,000 Days) & Pacha (360 Days) = 9,360,360 days/360 days = 26,001 Ancient Years. The day of a full moon, would always signal a specific date of a RE-START... 21 December 2012, was NOT the evening of the day before a full moon, and, 22 December 2012 was NOT the date of The Full Moon ... there are exactly 360 days - between 22 December 2012 & 16 December 2013, which is the evening of the day before a full moon, and, 17 DEC 2013 aka December 17th, 2013 is a full moon. "The Pagan, NEO-Pagan & Wicca Calendar utilized by Pagan, Neo-Pagan and Wiccan People also pins December 17th, 2013 aka 17 DEC 2013 - As, a very pivotal date on their calendar As, The Full Moon always winds down, and, closes a cycle, in this case, it is a grand cycle ending of Macha (9,360,000 Days) & Pacha (360 Days) = 9,360,360 days/360 days = 26,001 Ancient Years. 21 December 2012, was NOT the evening of the day before a full moon, and, 22 December 2012 was NOT the date of The Full Moon ... there are exactly 360 days - between 22 December 2012 & 16 December 2013, which is the evening of the day before a full moon, and, 17 DEC 2013 aka December 17th, 2013 is a full moon. The Eight (8) Major Event + Four (Minor) Heathen Brot Days on The Calendar... which celebrates 12 different Brots as Holy or Ritual Days. It is NOT exactly the same calendar utilized by Celtic People, who also utilise a calendar wheel, nor, it is NOT exactly the same calendar utilized by Pagan or Neo-Pagan. And, it is NOT exactly the same calendar utilized by Wiccan People who follow The Wicca Calendar. Those groups mentioned above, split the year into eight (8) sabbats, while Heathens celebrate eight (8) Blots, as their holy - ritual days. The chart pictured above (in this post) will show the time of the year, each of them occur.. The old tribes and, tribal people of The Baltic & Scandinavian countries, still follow & utilize this calendar. December 31st, 2013 - Small Asteroid 2014 AA Hits Earth !!! Discovered on New Year's Eve by a telescope in Arizona, a small asteroid struck Earth somewhere over the Atlantic Ocean — apparently unnoticed — about 21 hours later. A sequence of four images, taken roughly 9 minutes apart, reveals the movement of asteroid 2014 AA when it was discovered in northern Orion early on January 1st (Universal Time). The 19th-magnitude object struck Earth 19 hours later. The field of view is about 5 arcminutes across. It was New Year's Eve, but that didn't stop observer Richard Kowalski from scanning the sky for near-Earth objects (NEOs). He hadn't been using the 60-inch telescope on Arizona's Mount Lemmon for long when he noticed a 19th-magnitude blip skimming through northern Orion in a seven-image series begun at 11:18 p.m. MST (6:18 Universal Time on January 1st). After confirming that it was a new find, Kowalski dutifully submitted positions and times to the IAU's Minor Planet Center. Then he went back to the night's observing run. Thus did the Mount Lemmon reflector, part of the Catalina Sky Survey, discover 2014 AA, the first asteroid found this year. But at the time neither Kowalski nor anyone else realized that the little intruder was only 300,000 miles (500,000 km) from Earth and closing fast. This plot shows the range of possible locations where the small asteroid 2014 AA struck Earth's atmosphere early on January 2, 2014. As announced by the MPC earlier today, it's "virtually certain" that 2014 AA hit Earth. According to calculations by dynamicist Stephen Chesley (Jet Propulsion Laboratory), the impact occurred somewhere between Central America and East Africa. Chesley's "best-fit" collision is over the Atlantic Ocean just off the coast of West Africa at roughly 2:30 Universal Time this morning. More precision has come from an analysis of infrasound data by Peter Brown (University of Western Ontario). Infrasound is extremely low-frequency acoustic energy (20 hertz or less) created, for example, during energetic explosions. A global network of detectors, maintained by the Comprehensive Nuclear-Test-Ban Treaty Organization, can pinpoint the location and energy of any powerful detonation — including airbursts from meteoric blasts. The overlap of the white curves, from three marginal infrasound detections, shows where the small asteroid 2014 AA likely hit. However, this preliminary plot does not take winds into account, which might shift the true impact point somewhat further east. According to Brown, 2014 AA triggered very weak detections at three infrasound stations. His triangulation from those records, shown in the graphic at right, indicates that the space rock slammed into the atmosphere near 40° west, 12° north. That location, about 1,900 miles (3,000 km) east of Caracas, Venezuela, is far from any landmass. "The energy is very hard to estimate with much accuracy — the signals are all weak and buried in noise," Brown explains. And yet, he adds, we're lucky that the event happened just after local midnight, when winds are calmest. "Had this occurred in the middle of the day I doubt we would see any signals at all," he says. Brown's rough guess is that the impact energy was equivalent to the explosive power of 500 to 1,000 tons of TNT — which, though powerful in human terms, implies the object was no bigger than a small car. "It was no Chelyabinsk," he says. So 2014 AA was too small to reach the ground intact. But it must have created one heck of a fireball! The skies over the Atlantic were relatively clear last night. Alas, a search of ship- and plane-tracking websites turned up no vessels in that area — it seems that no one was positioned to witness 2014 AA's demise. "I'm not aware of any visual sightings," says William Cooke of NASA's Meteoroid Environment Office in Huntsville, Alabama. "Looks like it was too far away from human eyes." The impact occurred a little after 3h UT, Brown says. That's only about 19 hours after Kowalski's initial report to the MPC, and it's giving me déjà vu all over again. It's been just five years since another small asteroid called 2008 TC3 struck Earth over Sudan just 19 hours after its discovery by the same telescope. The difference between these events is that astronomers had nearly a day of advance warning regarding the 2008 impact. Telescopes worldwide amassed hundreds of observations before the object slammed into the atmosphere, and eventually many fragments were recovered. Based on images taken in the hours before its impact, asteroid 2014 AA averaged 110 million miles (175 million km) from the Sun in a low-inclination orbit that crossed paths with Mars and Earth. It was only a matter of time before it encountered our planet. Click on the image for an interactive version. There was no heads-up alert this time. "I'm kicking myself for not having spotted this," admits amateur NEO sleuth Bill Gray (Project Pluto). Most mornings Gray downloads "and yes, for me, it was holiday-related." Most mornings, he downloads the circumstances for recent discoveries and computes "what ifs" for potential impactors and near-misses. "However, on New Year's Day, I'd made arrangements to go with my family to visit my sister, go for a walk, stop off for a doughnut, shovel snow, etc., etc." He didn't realize an impact was imminent until last night — only a couple of hours before the impact. Let's cut Gray some slack and instead give him, Chesley, and Gareth Williams at the MPC a collective pat on the back. All three were able to conclude — based on just seven images taken within 69 minutes — not only that 2014 AA was going to strike Earth, but also roughly where and when. Mad props for that impressive number-crunching! Astronomers with the Mount Lemmon Survey used a 60-inch (150 cm) telescope in Arizona to spot 2014 AA on January 1, 2014 at 6:20 UTC (1:20 a.m. EST). Other astronomers quickly confirmed its presence. 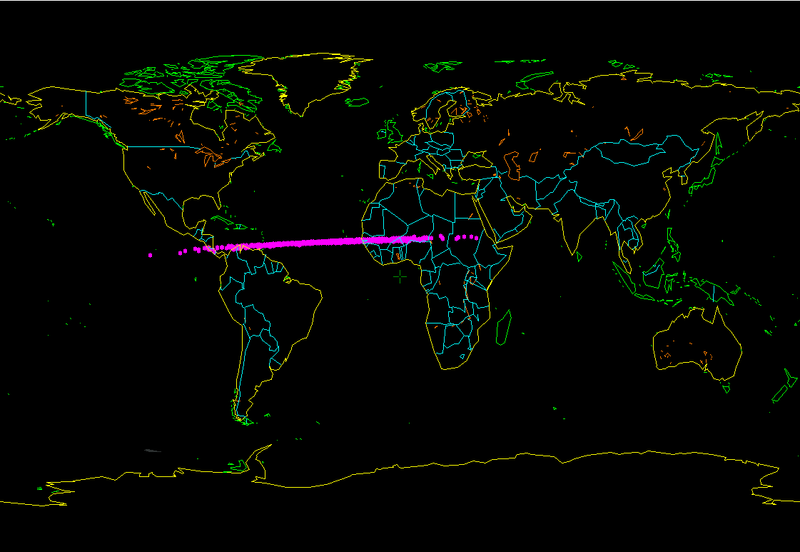 A calculation of the asteroid’s orbit showed it was very close to Earth, and getting closer. According to astronomer Pasquale Tricarico, the asteroid approached the Earth from its night side. However, he said, there are large uncertainties over the time and location of the atmospheric entry of this asteroid, because only 7 observations were made while the asteroid was still visible. 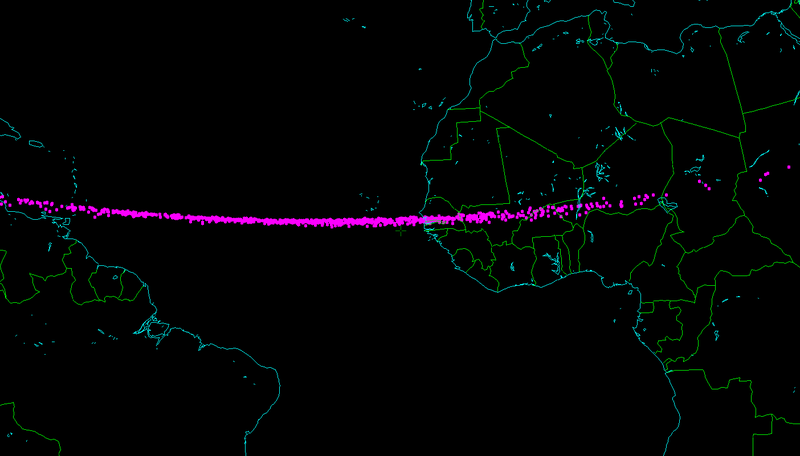 Calculations by astronomer Bill Gray show that it could have entered the atmosphere between Africa and Central America. No harm done. But the event underscores the need to watch out for near-Earth asteroids. The view from asteroid 2014 AA on January 2 as it collided with Earth. Animation via Pasquale Tricarico via Ernesto Guido via Wired. Bottom line: A small asteroid – probably 1-5 meters across – probably burned up over the Atlantic Ocean around midnight on the morning of January 2, 2014. Astronomers have labeled it 2014 AA.